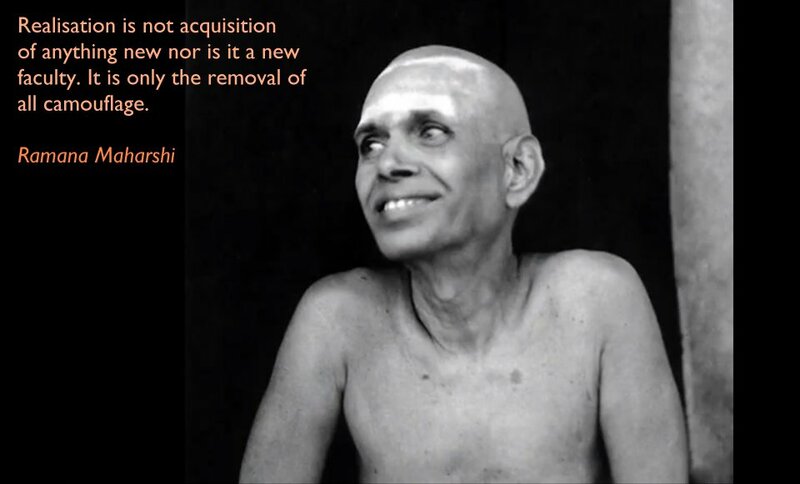 I added the Ramana Maharshi Quote and our discussion to my blog and thought I would send you the link because the distinction offered by Ramana is an important one. Jnani is the path of Knowledge by which false understanding (ignorance) is stripped away. It asks ‘Who am I?’ As distinct from Bhakti which is the path of Devotion. Our leaning toward one or the other is a predisposition in our Nature. There are a handful of jewels that illuminate the path to emancipation beyond which nothing else is required. We come with all the tools necessary to realise enlightenment. A single idea defines the Nature of Reality. ‘We are Consciousness’ . That’s it. That is the mystery. But the realisation of the profound depth of this simple statement requires an inner condition, [Or you can say an inner stance – a way of being internally] or it cannot be a stable experience. The most important thing to understand is that there is nothing to gain. There is nowhere to go. The path is only a process of removing obstacles to the realisation of that Truth. By being a conscious being you are a channel for consciousness, Now, Now, Now. It is there always in its absolute perfection at your heart (centre of your being). All that is required for us to experience it is the sweep away Ego/Mind. Ego/Mind is like a forest that stands between us and the rising sun. There is no problem with the sun. Only the presence of the forest blocks our view. This understanding is a Jnani concept. Two ways fell the forest – insight (knowledge) and devotion (complete surrender to God or Self. And by this I do not mean the God of speculation that is a mental construct). The result of rendering Ego/Mind silent is the experience of Bliss – a property of Consciousness. It is ‘that peace that surpasses all understanding ’ about which all sages speak and which fuels what often becomes an Ego driven craving for emancipation particularly when emancipation is seen as a panacea for mental turmoil. That Sublime Peace is always present but drowned out by Mind. If encountered a devotional person will likely experience this Bliss as a love for God. We can be an atheist (rejecting of a notion of God) or a believer (accepting of a notion of God) it makes no difference because both these are attached to the Ego/Mind and not Reality. When bliss manifests in experience, concepts are irrelevant. Many people accidentally experience a Bliss State. History is awash with them and profound as it appears at the time this is not the stable state enjoyed by Seers because Enlightenment is a dynamic not a passive state requiring the penetrative insight that prevails in Satwic Mind (a state of harmony, balance, joy & insightful wisdom). It can be fleeting or last for hours or even days, but in the absence of any fine understanding or guidance the individual will usually becomes mentally unstable by trying to cling to the experience and all too often will be diagnosed as delusional or even psychotic. This premature experience is not one to invite without access to a wise teacher. If it happens then understanding its nature and cause is everything. In 1988 I ran a meditation course in Surrey. Nineteen people enrolled. Before I started the first session I asked how many people were there because they had had what they would term a Spiritual Experience. All but two or three hands were raised. In those days I was nowhere near a reasoned explanation. The clue as to why it happens, unbidden, lies in our devotional nature. And this is also the key as to why it is usually intentionally unrepeatable. Many people who have ‘enlightenment’ experiences spend years trying to repeat what they think they did or make the experience mean something when it means nothing – except to reveal only that we are Consciousness. Actually it was what they did not do that made it occur. It is the Ego that wishes to repeat the experience. It will fade as soon as the Ego asserts itself again – as my experience. Quite often the experience is accompanied with tears of joy, and a feeling of complete devotion to God. The experience of the Self is beyond description and life changing. In such moments there is no desire. One is completely fulfilled – immersed in unconditional love. But ultimately devotion is not enough. Anything suppressed can reassert itself so one has to realise the true nature of the Self and remove all impressions (Sanscaras) to be a completely free Soul.